MIAMI – (RealEstateRama) — The MIAMI Association of REALTORS® (MIAMI) hosted 40 foreign delegates from 10 countries and hundreds of South Florida Realtors during its 23rd annual International Real Estate Congress in October at the Biltmore Hotel in Coral Gables. 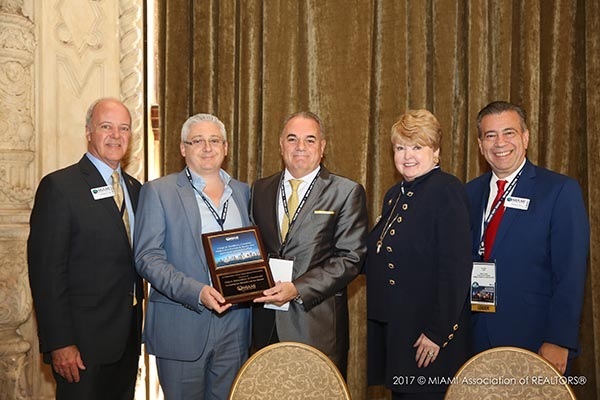 MIAMI signed two international collaboration agreements at the 2017 Miami Congress, increasing its number of global agreements to 167 — the most of any Realtor® association in the United States. The three-day Miami Congress featured eight international market briefings from MIAMI partner associations and insight from 10 distinguished real estate speakers. MIAMI signed international collaboration agreements with Colegio de Martileros y Corredores Públicos del Departamento Judicial de la Plata (Argentina) and FNAIM Aix-Marseille-Provence (France). The alliances create business opportunities for MIAMI members, enhance Miami’s global position and strengthen the local real estate market and economy. The agreements provide resources, visibility and connections for our valued international partners. MIAMI has international partners in more than 50 countries and five continents. MIAMI CEO Teresa King Kinney revealed initial findings from the 2017 MIAMI Profile of International Home Buyers during the 2017 Miami Congress. The report is prepared annually for MIAMI by the research division of the National Association of REALTORS® (NAR). The survey will be released by MIAMI in early 2018. National Association of REALTORS® (NAR) Vice President of Research Paul Bishop — a keynote Miami Congress speaker — outlined Canada, Mexico, Vietnam, China, India and Eastern Europe as the top foreign markets to watch for U.S. real estate purchases in 2018. Miami is a top destination for foreign buyers because it has a thriving financial center, an advantageous geographic location, access to trade, a growing multicultural population and more. International and domestic buyers also get more money for their investment when they purchase in Miami. A diversified group of countries (not just Latin America) are searching and buying Miami real estate. A power-packed South Florida brokers panel of Alicia Cervera of Cervera Real Estate, Philip J. Spiegelman of ISG World and Peggy Fucci of OneWorld Properties, discussed Miami’s emergence as a global city. Real estate professionals from Argentina, Brazil, Canada, Colombia, Ecuador, Dubai (UAE), France, Italy, Serbia and Spain participated in the 2017 Miami Congress. Conference goers heard global market updates about France, Dubai (UAE), Spain, Argentina, Colombia, Brazil (two presentations) and Italy. 2017 Miami Congress Diamond Sponsors: Artesia, Festival Minto Resorts Orlando, Miami Herald Media Company and MintoUSA.com. Platinum Sponsors: Missoni Baia Miami Residences and Perez-Roura Law. Gold Sponsors: Aria on the Bay Miami, Botaniko Weston, Espejo & Asociados, Modern Doral, Residencial Roble, Residencial Stella and Seawinds Punta Goleta.